A: Nope! At HoodBeast you can order as many or as few as you’d like. Order 1, order 1000. We do however, offer bulk discounts. So the more your order the more you save. A: Due to the nature of our service we will only customize garments which are purchased on our website. A: HoodBeast ships orders all over the world on a daily basis. If you have an internet connection chances are we ship to you. At the checkout, you will have the option to choose your country from the drop down menu. A: This is entirely dependent on the size of your order and location. We advise you create a dry run of your order and enter the location you wish to ship to. Our system will calculate the exact shipping cost for you so you can make a quick decision. A: Our orders are fully custom and made from scratch. Due to the high quality nature of our customization process your order may take up to 3 weeks to be processed and shipped. That doesn’t mean it will always take 3 weeks; often our products arrive sooner, but we do keep this information here as a disclaimer. Our goal is to get you your order as fast as possible, but what is most important is that we make your hoodie look awesome. You can use our shipping calculator to estimate how long it will take for your package to arrive. Q: How many colors can you print in a logo? A: Currently HoodBeast offers up to 8 awesome colors for your logo. Q: How big can my logo be printed? 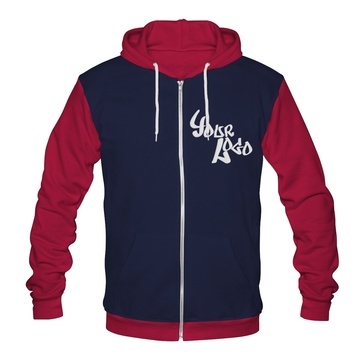 A: Logos on the front and back of a hoodie can be printed up to a maximum size of 10” high x 10” wide. A: We do provide sample orders; but at a small fee. Please enquire for details. A: Unfortunately we can’t facilitate walk-ins. We have locations across North America but these are strictly work environments and production facilities. Don’t worry though; all of the finer details for our items can be found in our online catalogue. A: Of course! The more you buy, the more you save. See the discount chart in our designer for more details. A: HoodBeast accepts all major brands of payment including Visa, MasterCard, and PayPal. A: We have sizing charts for you to reference for all corresponding products. However as a general rule we advise you choose whatever shirt size you are currently wearing!